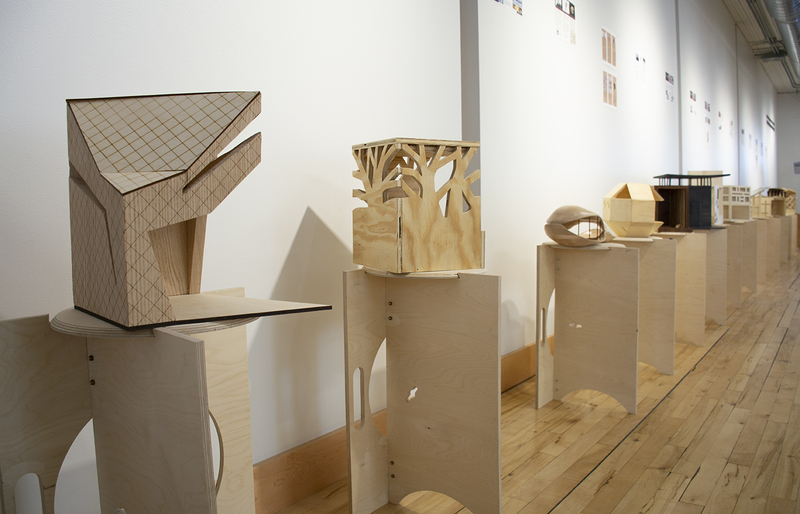 Architecture for the Birds is a popular annual exhibition in partnership with the North Dakota State University Department of Architecture & Landscape Architecture. The work is the result of a design challenge posed to participating students: to design and build a birdhouse based on the work of a Pritzker-Award-winning architect. In addition, students are asked to design a space suited for the needs of a specific local bird, considering the bird’s favored environment, nesting habitat, spatial needs, numbers of family members, and patterns of use. Architecture for the Birds is a pedagogical exercise rooted in environmental stewardship, community collaboration, and a passion for design. This annual exhibition is sponsored by Longspur Prairie Fund, NDSU, Craig Larson Landscape Architects, Engage BUILD, Contour Design Studio, Studio Birke, and Office Sign Company. We invite the public to participate in this competition through the People’s Choice Award for Best Overall Design. Stop by the gallery to cast your vote for the most creative solution to the design challenge. Winner will be announced on Monday, August 26.